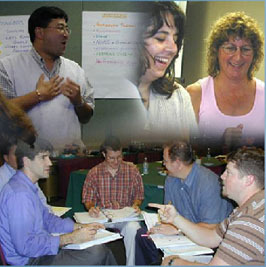 “I have recently completed a great management training program taught by Amy Henderson of Henderson Training. I have done several over the years, and find this one to be the best to date. She runs an outstanding training program for managers and covers a wide range of topics. In my own experiences within the industry, as well as those shared by others, good and effective management in video game development is a rare commodity. We have many talented and creative people (100+ in some cases) doing very creative things and solving very complex problems and effective leadership of that talent is crucial. Add to that the millions of dollars it now takes to develop a competitive product, and a lack of solid leadership can (and usually does) spell disaster. In many cases throughout the industry, our managers are just artists, designers, and programmers, that do such a great job that we will promote them into positions of managing others in order to justify the salaries we need to pay them to stick around. What we do not usually do is invest in making those individuals great managers. It is an entirely different skill set that needs to be developed. I could probably turn this blog post into a full-fledged article on this topic (maybe I will when I have the time), but for now I really just wanted to say, and encourage, companies within our industry to invest the time and resources into your ‘star’ employees to make them great and effective managers. It is critical to your success and growth potential! "Amy brings the highest level of energy and charisma to any learning event, engaging the audience and helping people advance their development and their careers. Having worked with Amy on a couple dozen occasions, I've experienced her training first hand and have seen her coach various colleagues and help make a difference in people's lives, including my own. Whether it's individual coaching, team training, training design or other developmental needs, Amy helps an organization by tailoring her talents towards the client's needs and the people involved. An expert in the field of training, Amy can ramp up anyone's skills in a multitude of developmental areas. Amy brings a level of creativity and interaction that elevates the level of learning for all members who experience her work. Having experienced Amy's work for over ten years, I recommend Amy to any business or person who is looking for that "catalyst" in learning to elevate their development and their business." “Our company, Business 21, does about 200 Webinars per year and has a stable of top speakers on our faculty. By far the most important criteria for judging our speakers is participant evaluations. Our audience can be brutal on speakers who don't deliver take-home value. But Amy, who has done dozens of programs for us, always has exceptionally high ratings. She really knows her stuff and her delivery is clear and authoritative. Amy is a star among stars at Business 21. Icing on the cake: She's extremely reliable and easy to work with"
“Amy is currently providing THQ employees with Leadership training which consists of various helpful topics to assist us with our daily obligations to the company. Amy is an energetic, knowledgeable trainer with a wealth of helpful ideas. Amy takes a genuine interest in the success of the employees she trains and actively displays this every occasion she's at THQ. I cannot put into words how valuable her training methods are to my personal growth with THQ and I hope to remain in constant contact with her for years to come. I feel that I can trust her advice and take her words to heart. Thus far, all of the training tips she has provided me have really helped advance my managerial techniques and I directly credit her with my recent promotion to Senior QA Lead. I could go on and on about the benefits of Amy's training but I'll just close by saying that any company contemplating hiring her for her training services, should ABSOLUTELY do so."